I spent a few decades actively involved in the sports memorabilia world, both as a collector and a seller. In fact my dad owned and operated a baseball card shop in the 1990s back when that was actually something you could earn a living at. I’ve attended shows and conventions in at least a half dozen states plus Canada. I’m not active in it any more – I sold off most of my stuff over the years, and at least some of that money ended up going to records. But that’s not why I’m bringing up my hobby history. It’s because the sports memorabilia world was the first place I heard people refer to “The Holy Grail”, or often simply “Grail”, in a context that didn’t involve blood and wine. Back in the day auction catalogs constantly tried to outdo each other in hyperbole, and one of the ways they’d do that was to refer to a rare or valuable item as “The Holy Grail of [fill in the blank]”, with [fill in the blank] replaced by “Tobacco Cards” or “Babe Ruth Cards” or “Hall of Fame Autographs” or “Greg Jeffries Donruss Rookie Cards”. (♠) Generally the term was used to describe the best of something. In the record collecting world the term Grail is used in a similar way, but one that is more personal. It’s not unusual for a collector to as another “what’s your Grail”, meaning the record that you desperately desire but don’t have either due to cost or scarcity, the record that always seems to have been found by someone else 15 minutes before you got to the shop or show, your elusive vinyl nemesis. I don’t think I’ve had a Grail per se since getting back into vinyl, but the closest album is probably Þeyr 1980 debut Þagað Í Hel. It’s the one album that I’ve actually told people, “if you ever get a copy of this for sale, put it aside because I’ll 100% buy it”. It’s the only album I ever marked as a “Want” on Discogs. And I haven’t seen one for sale anywhere since I started looking a few years back. Sure, an acquaintance on Facebook had a line on one for a while, but that fell through, and apparently I was a few weeks too late to Reykjavik Record Shop a few years ago and a collector from Japan walked out with their copy. I wouldn’t say I’ve been actively looking for it, but I’d also say I put more effort into trying to find a copy than I have for any other record. And about two weeks ago I got an automated email from Discogs letting me know that a seller just posted a copy of Þagað Í Hel that day. Within five minutes of getting that email I ordered it, then endured a painful 10 day wait for it to make it here from Sweden. On Thursday I snuck out during my lunch break and picked it up at the post office, and today I’ve been sitting here just sort of looking at it, almost afraid to play it. The collecting drive is often more about the chase than the actual having of the object, a perversely masochistic mindset. But I can’t put it off any longer. It’s been cleaned on the Okki Nokki and is ready to hit the turntable. 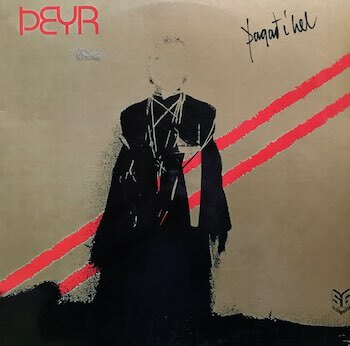 Þeyr got their first record deal on the strength of a couple of pop songs they’d written, but when they went into the studio to cut Þagað Í Hel their style changed to something more new wave-ish, so much so that it almost didn’t get released. Reportedly somewhere between 300 and 500 copies were pressed, and according to legend the masters were destroyed in a fire, which likely explains in part why none of these eight songs ever made it onto CD. The opening track “En…” is reminiscent of early Talking Heads, followed immediately by the rockabilly-inspired “…Nema Jói”, so clearly there are no rules being followed here. Which leads us to “Hringt”, adding a sort of disco thing to the mix and starting to give me the sense that Þeyr was still exploring at this point in their trajectory together, not yet having established the more post-punk sound that came to define their handful of later releases (they last performed in 1982 and put out their lasts release, a 7″, in 1983). By the second half of “Heilarokk” we start to get some glimpse into the direction they eventually went, breaking free of traditional song structures into something unique to Þeyr. Of course the ABBA-like “Eftir Vígið”, replete with it’s female vocals and harmonies, is like an unexpected bucket of ice cold water on your head. Þagað Í Hel certainly wasn’t the record I expected, but it does provide some insight into the band’s early influences and is an intriguing starting line when you consider how they sounded on Mjötviður Mær (which was the very first record I ever wrote about on Life in the Vinyl Lane) just a year later. It remains impossibly hard to find, but fortunately some intrepid souls have recorded these eight tracks and posted them on YouTube!, so if you want to give them a listen just go search there using the album name. Until I sat down to do a little research for this post I’d never heard of the German Neue Deutsche Welle (New German Wave) movement. Welch Ein Land ! – Was Für Männer was released right at the time NDW was breaking out of the underground and becoming mainstream. 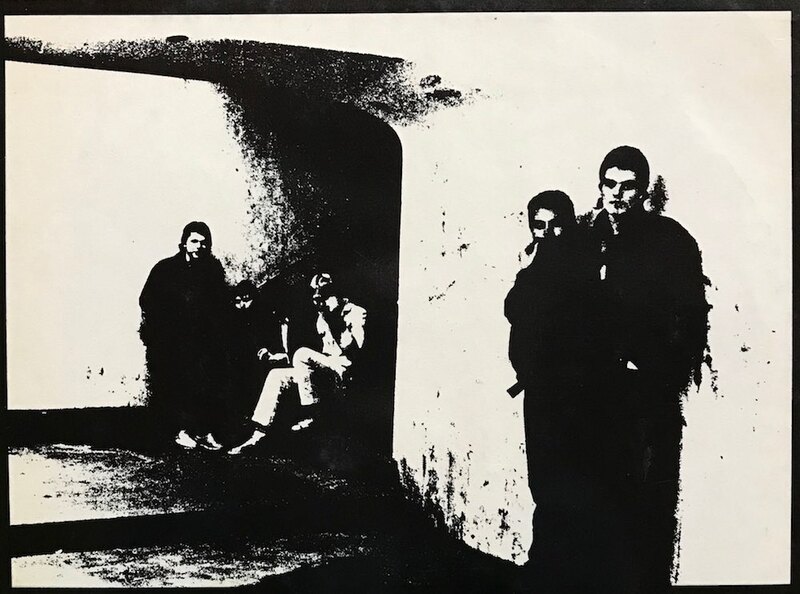 The feeling I get from it is fairly typical new wave with elements of The Beat and Berlin, though there are some darker tracks like “Polizisten” that bring a post-punk aesthetic (and feels a little like something off of The Wall). The whole thing is surprisingly good, particularly the dark B side opener “Der Präsident Ist Tot” with its relentless beat pounding you into submission like a military march. 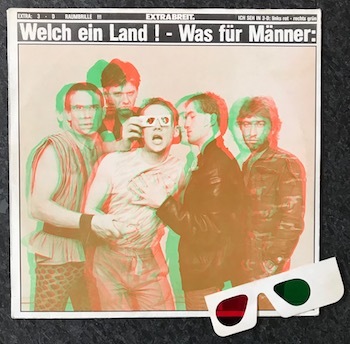 The cover has that old school 1980s style of 3-D printing (and the album’s opening track is titled “3-D”), and sure enough the album includes a pair of those 3-D specs you used to get at the movies – the cardboard frames with one red and one green lens, only without the arms to hold them behind your ears. These work about as well as you remember, but if you get the angle and lighting right the effect can actually be momentarily startling. So if you come across a copy of Welch Ein Land ! – Was Für Männer make sure to see if the specs are there. And speaking of 1981, compliments to the far right rocking the sweet calculator watch. Most of the time I dig at Half Price Books I come away empty handed. But every now and again there’s something interesting hidden in there among all the beat up Chicago and Gordon Lightfoot records. 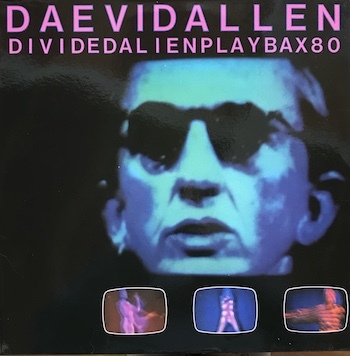 Something that leaves you scratching your head and thinking, “how did that get here?” One of those albums was this 1982 UK Daevid Allen release Divided Alien Playbax 80. I bought it because it seemed weird. I didn’t realize at the time that Allen was also part of Gong and New York Gong, not that that would have necessarily impacted my decision. But these random connections both surprise and intrigue me. Like New York Gong, Divided Alien Playbax 80 has a certain avant garde-ness to it, albeit in a different way, brining more synths, electronics, and tape looping to the recording. Much of side A is given over to brief vignettes, the longest of which clocks in at just over two minutes. The album is bookended with a pair of extended jams, opening with the eight minute “When” and closing with the nine minute “Smile”. Much of it is instrumental and when there are vocals they tend to be something strange. The whole thing is a bit hard to wrap your head around. If I’m picking favorites I’d probably go with “Disguise” and “Bodegas”, the later of which sort of reminds me of my Argentinian friends Farmacia. 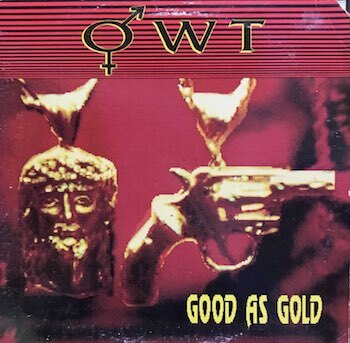 I’m not sure what to make of Good As Gold. OWT was the partnership of harpist (yes, I said harpist) Zeena Parkins and percussionist David Linton. The pair also brought some keyboards, digital, and even tape looping skills to the project, which in many ways feels like some kind of bizarre free-jazz-meets-no-wave thing. Experimental? Yeah. Thought provoking? Definitely. Enjoyable? Well… it’s challenging. The compositions have quasi-structures, but there’s so much happening that the listener never gets comfortable, which may well be the point. “Dream Mint” is my favorite piece, something a bit more restrained with some intriguing electronic elements thrown in for good measure. 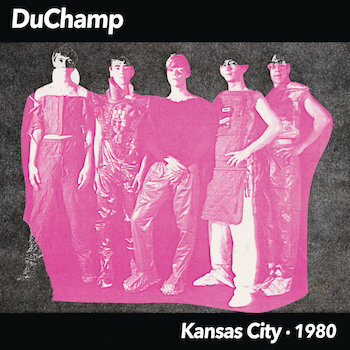 Duchamp were a new wave band originating from Kansas City back in the late 1970s/early 1980s. Kansas City 1980 is a recent comp that includes the six songs from the band’s first three singles, plus three previously unreleased tracks. Described on the jacket as “devolved post punk with a funky backbone and a distinctly midwestern art-rock vibe”, to me it’s more new wave in the spirit of Devo. “What You Say” could be a deranged, arty Iggy Pop song, while other numbers like “Intimacy” are more straight-forward rock. “Atomic Crusader” is like a collaboration of the Violent Femmes and Meat Loaf. It’s all just a bit strange. I don’t get any of the gloominess that defines so much of post-punk – Duchamp is very poppy and jingly and jangly and weird without coming across as pretentious. You can explore Kansas City 1980 at the label’s Bandcamp page HERE. It looks like the first 100 copies were on pink vinyl and included a cassette re-release of Duchamp’s 1982 album Change. Unfortunately I have the regular black version, which somehow is a cutout – odd given that it just came out this year, so I have to assume it was some kind of promo. My name is Jeff, and I'm just a guy with a turntable and an iPod who is constantly looking for new (and not so new) music with my sidekick Holly. You can email me at jeff@seattlehockey.net. You can follow the blog on Facebook as well - search FB for "Life in the Vinyl Lane" and Like it!